High-temperature corrosion is a major problem affecting sectors such as the power generation, aerospace and metal-working industries. This important book summarizes a wide range of research on ways of dealing with this important problem. The first part of the book reviews ways of modifying alloys to improve high-temperature corrosion resistance. The second part discusses surface treatments such as pre-treatments and coatings. The third part of the book summarizes research on testing for high-temperature corrosion resistance and the development of common testing standards. It also reviews research on the behavior of alloys in a wide range of service conditions such as furnace and boiler environments. The final part of the book discusses ways of modelling high-temperature corrosion processes to improve material performance and service life. 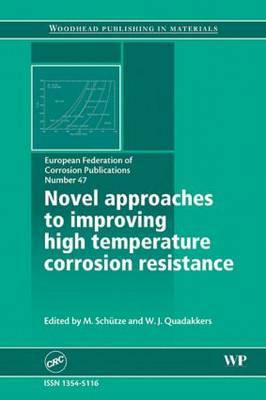 With its distinguished editors and team of contributors drawn from some of the leading centers of research in the field, Novel approaches to improving high-temperature corrosion resistance will be a standard reference for all those studying and dealing with high-temperature corrosion.